The 1&2 Samuel Evangelical Exegetical Commentary (EEC) is the final work of beloved and renowned scholar Harry A. Hoffner Jr. Hoffner, before his recent death in March 2015, was John A. Wilson Professor of Hittitology Emeritus at the University of Chicago. He was an expert on the ancient Near East and, as the above title suggests, specialized in the language, history and civilization of the Hittite empire. One of his greatest achievements was co-editing The Hittite Dictionary of the Oriental Institute of the University of Chicago. Hoffner’s ancient Near Eastern expertise is one of the great strengths of the Evangelical Exegetical Commenatry on 1&2 Samuel. Nearly every page offers some parallel or insight from his extensive knowledge of Hittite, and ancient Mesopotamian literature. Such a statement might frighten off those less experienced in the study of the Old Testament, and indeed, it is not a commentary for beginners. However, the pastor, the graduate student, the professor, and the more advanced learner will benefit greatly from Hoffner’s exposition. Knowledge of Hebrew is presupposed as the commentary utilizes Hebrew in both its normal alphabetic and transliterated forms. 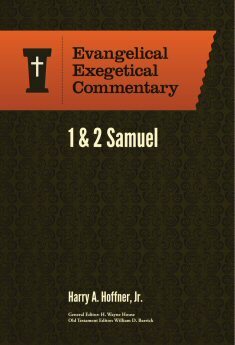 Before commenting further on Hoffner’s commentary on 1&2 Samuel, let me share the purpose behind the Evangelical Exegetical Commentary series in the words of its creators. “The Evangelical Exegetical Commentary is a brand new, 44-volume commentary series which incorporates the latest critical biblical scholarship and is written from a distinctly evangelical perspective. Published by Lexham Press, the EEC is the next standard commentary on the entire Bible for evangelicals. . . .The publication of the EEC by Lexham Press marks the first time a major Bible commentary series has been published in digital form before its print counterpart—and the first time it has been published with a digital format in mind.” The purpose behind the creation of a digital commentary, in the words of one of the editors of the series H. Wayne House, is so that a commentary can be easily updated. If a new understanding of a word is discovered or some new archaeological information comes to light, it can be added immediately. This is indeed an extremely attractive feature of the Evangelical Exegetical Commentary series! (For a short video explaining the nature and purpose of the series click HERE). Author of the Evangelical Exegetical Commentary on 1&2 Samuel, Harry A. Hoffner, Jr. The editors of the ECC have apparently put no restrictions on commentary length (another plus of a digital edition!) and Hoffner takes advantage of this by producing a voluminous commentary. Logos has yet to add page numbers to this particular volume (which makes citation challenging!) and so I can only hazard a guess on its size. It is certainly well over 1,000 pages, but how far over I can not tell. With no space limitations, Hoffner begins the commentary by launching into a thorough and lengthy Introduction. The Introduction includes the usual topics of title, authorship, date, historical context and scope, and structure, but it includes much more. Some of the other areas addressed (and there are too many to name them all) include genre, theme, sources, literary analysis (including a lengthy section that summarizes and evaluates many of the characters of 1&2 Samuel), and extrabiblical parallels (which, given Hoffner’s expertise, comes as no surprise). There are two things that I would like to note from this introductory material that bear on a commentator’s interpretation of 1&2 Samuel. First, Hoffner is not a fan of using the term “Deuteronomistic History,” to describe the books of Joshua-Kings, noting that such language overlooks the many parallels and allusions to the other books of the Torah (Genesis-Numbers) found throughout Joshua-Kings. While he believes that much of the material regarding David and Saul could have been written and preserved in the palace archives, he has no difficulty in seeing a final author or editor putting 1&2 Samuel in its final form during the exilic period. Rather than state firm conclusions on this matter, Hoffner is content to make general observations. 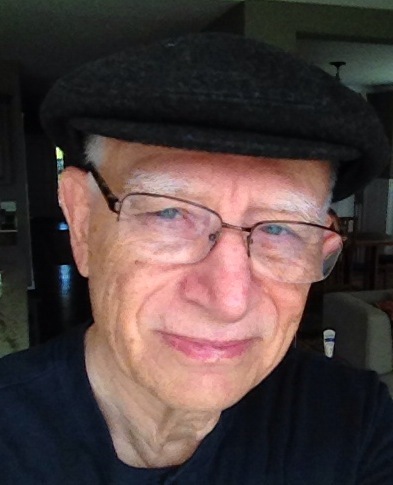 Second, Hoffner is not a fan of “the hermeneutic of suspicion.” In his comments on the characterization of Abner and how scholars frequently conclude that David was responsible for Abner’s death, Hoffner remarks, “Typical of this “Damned if you do—damned if you don’t” hermeneutic of suspicion is Paul Ash’s statement: “Although the text does not implicate David in Abner’s murder, some scholars believe that he may have ordered it since 2 Samuel tries so hard to say otherwise.” Obviously, the narrator denies David’s complicity in order to dispel rumors to the contrary—rumors spread by David’s Saulide opponents. Should not the text record this?” (Hoffner, H. A., Jr., 2015. 1 & 2 Samuel. H. W. House & W. Barrick, Eds. Bellingham, WA: Lexham Press). Later on in his exposition of 2 Samuel 12:22-23, he takes another stab at the skeptics when he writes, “In the end, as is often the case, the scenarios of skeptics require more leaps of faith than belief in the tooth fairy. If one is permitted to simply ignore large chunks of the tradition and make up others, one can “prove” anything! . . . .We are wise not to second-guess the text.” Any who have read my reviews on 1&2 Samuel commentaries are aware of my own disdain for the hermeneutic of suspicion. I couldn’t be more pleased with these comments by Hoffner because they demonstrate that he takes the text seriously. Hoffner breaks the commentary down into literary sections. Each section begins with an overall summary and introduction. This is followed by a more detailed outline of the section which provides the basis for the verse-by-verse commentary. A bibliography accompanies the detailed outline and is then followed by the Hebrew text itself with Hoffner’s accompanying notes on the text. Since the Hebrew text is noticeably absent from the Esther volume in this series (although there are notes on the text), it appears that it is up to the authors to determine the format of their commentary, at least to some extent. Hoffner’s english translation follows the textual notes which then leads to the verse-by-verse exposition. There is always a short summary of the portion of the text under examination followed by a discussion of the verses themselves. The commentary is frequently punctuated with other features such as sections entitled: “Exegetical note,” or charts comparing features of the text, gray panels that set apart a special discussion (e.g., one on siege warfare at the beginning of 1 Sam. 11), and from time to time a concluding section entitled, “Application and Devotional Implications.” Following each smaller section of exposition is yet another bibliography. One of the strengths of this commentary is its prolific bibliography, which of course can be updated as new works appear. 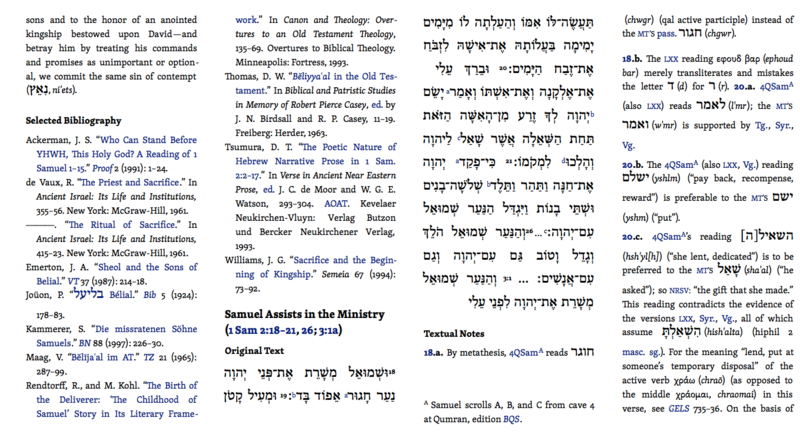 The screen shot above shows a sample page of the commentary in which you can see the selected bibliography, Hebrew text, and textual notes features. Among the many strengths of this commentary, I have already noted Hoffner’s knowledge of the ancient Near East (besides the many parallels he introduces, I would also include his fresh translation of the Hebrew text), the bibliographic resources, the comprehensive nature of the commentary, and its update-ability. Although the commentary may not suit a novice, I am also impressed with the attention that Hoffner pays to character development in 1&2 Samuel and his attempts at sharing application and devotional thoughts. Some examples of his devotional application include his comment on 1 Samuel 24:7-8 (David’s men are encouraging him to kill Saul), where he notes that we should not interpret things in our favor when they violate God’s law. Another timely example (considering the upcoming US election) are Hoffner’s introductory comments on 2 Samuel 13:39-14:33. He states, “As readers, we are invited to consider the full weight of sin, to see the social and public consequences of David’s personal adultery and murder.” This dimension is often lost sight of when media arguments are made against considering the personal sins of leaders in political debates. It is unwise to keep the personal and the public lives of leaders separate” (Hoffner, H. A., Jr., 1 & 2 Samuel, 2 Sa 13:39–14:33). These types of applicational interpretation will certainly be welcome material for a pastor or Bible-study leader. The fact that this commentary series is published by Lexham Press and is available on Logos is yet another bonus. The ability to quickly read Scripture references, or footnotes by simply hovering over them with the mouse, or to pull up other commentaries or Bible Dictionary articles referred to by the author which are automatically linked to the resources in your Logos library, are just some of the wonderful benefits available to Logos users. As with any book, you can highlight important comments, take notes, or paste quotes into a folder for future use. Logos users will be familiar with all of these advantages, and many others, which make study easier and more profitable. The entire series of the Evangelical Exegetical Commentary will consist of 44 volumes including both Old and New Testament. As with any commentary, there are going to be questions over particular interpretations. Some of my disagreements include the significance of Eli’s chair, which Hoffner sees as a sign of Eli’s old age, rather than (what I would interpret as) a clear allusion to royalty. At times I quibble with his estimation of a character. For example, like many scholars Hoffner is aware of Joab’s brutality, but insists on his complete loyalty to David. 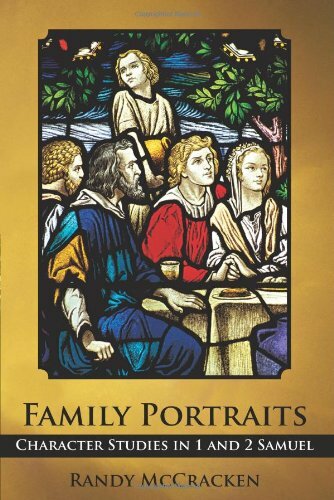 I have written extensively elsewhere on my disagreement with this assessment of Joab (see Family Portraits, pp. 258-300). One shortcoming I note is that Hoffner sometimes seems reluctant to let the reader know where he stands on ambiguous or difficult passages. For example, he states that the longer text of 1 Samuel 11 (found in the Dead Sea Scrolls and LXX) suggests “a long period of brutal oppression.” But his only comment is “if we accept the longer text.” There is no further discussion as to whether he accepts or rejects the longer text or what his reasons might be. The story of David and Goliath (1 Sam. 17) introduces an even more thorny textual issue (the LXX version is much shorter than MT) which Hoffner dismisses by stating that Chisholm has convinced him that the MT makes sense as it stands and is not hopelessly contradictory. Granted, not every textual issue can be discussed ad nauseam, but given the length of this commentary, and Hoffner’s expertise, it is surprising how frequently he opts for no discussion. Furthermore, he does not offer anything new on the interpretive difficulties of 1 Samuel 17:51-53, 55-58 and, in fact, dismisses these difficulties by simply stating, “There is no lack of competing explanations for what appears to be a jarring contradiction between this present passage and what has preceded” (Hoffner, H. A., Jr., 1 & 2 Samuel, 1 Sa 17:55–58). Finally, once in awhile, Hoffner appears to contradict himself. For example, in 1 Samuel 13:3-4 Hoffner states that it is unlikely that Saul is stealing the glory from Jonathan by claiming victory over the Philistines. Yet in 1 Samuel 17:38 he states, “Previously, Saul had claimed some of the glory due to his son Jonathan’s courageous attack on the Philistine outpost.” Another example may be found in the commentary on 1 Samuel 25. In his introductory comments Hoffner disagrees with the theory of some that the Abigail mentioned here may be his sister by the same name. However, later (in the commentary on 25:3) he notes others who hold this view and quotes Youngblood at length. By not restating his disagreement with this view, one could get the impression he is agreeing. The above may seem like quite a laundry list of “weaknesses” and yet, given the size of this volume, they are not serious threats to the value of this commentary. In fact, I have to admit I am being quite picky. For those desiring an in-depth look at the books of Samuel, Hoffner’s commentary offers plenty to chew on. The Evangelical Exegetical Commentary on 1&2 Samuel will be an indispensable resource for years to come for those who desire to delve deeply into the message of these books. I heartily recommend it for your library.